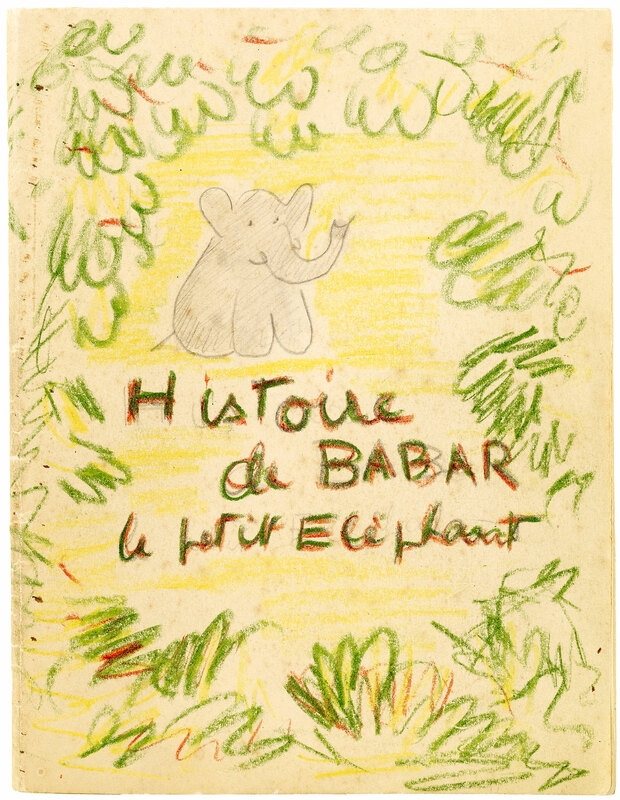 Histoire de Babar, le petit éléphant : collection of autograph manuscripts, illustrations, and plans for the published book, ca. 1930-1931. Gift of Laurent, Mathieu, and Thierry de Brunhoff, and purchased with the assistance of The Florence Gould Foundation and the Acquisitions Fund, Fellows Endowment Fund, Gordon N. Ray Fund, and the Heineman Fund, 2004. The title page of the early draft lists Cecile de Brunhoff, Jean's wife, as co-author. Before Babar was a story known by children around the world, it was a story that Cecile told to her own children. According to Laurent de Brunhoff, his mother requested that Jean de Brunhoff be listed as sole author of the published version that he wrote and illustrated. Collection includes the preliminary design and layout for the book (21 x 16 cm. ), which contains 44 pages of graphite and watercolor sketches with the original text for the Babar story; the dummy with the original handwritten text and many of the original ink and watercolor illustrations (27 p.); Jean de Brunhoff's notes on color for his illustrations (11 p.); draft illustrations in pencil with draft text (53 p.); watercolor studies (4 p.); and variant illustrations for the Babar cover and for the first page of the book (3 p.). Acquired by the Morgan Library in 2004 from the de Brunhoff family through the Mary Ryan Gallery, New York.